This behavior, of course, did not occur in a vacuum. The federal government and several state governments, sometimes quietly and more often quite publicly, were actively broadcasting the new state of permission and removing the doors from the white supremacy dog kennel. Trump’s attempts at banning Muslim immigration, even unsuccessful, served to keep the issue of race – the Other – in the news and remained wildly popular among his base supporters, the very population that had been waiting for this new state of permission to enact the most brutal fantasies. Of course, not all of his people are overt racists. But if you still think that “the Russians” or “the economy” rather than racial animosity and fear was the primary factor in the election, please read here or see my Blog series on the election. Five states have already enacted bills to cut back on voting access, and one more is on the verge of doing so. By comparison, three states enacted voting restrictions in 2015 and 2016 combined. Overall, however, more bills to expand access to voting were introduced this year than bills that would restrict voting access. Still, of the legislation making the most substantial impact on voting access, more legislation to limit participation is advancing toward passage. Moreover, governors in Nebraska and Nevada have vetoed the bills that would expand access to the franchise… Overall, at least 99 bills to restrict access to registration and voting have been introduced in 31 states. Thirty-Five such bills saw significant legislative action (meaning they have at least been approved at the committee level or beyond) in 17 states. Racial profiling. Random police stops. Raids at homes and businesses. People of color pulled from vehicles at checkpoints. Seizures of individuals with no criminal records or who never committed a serious crime. Imprisonment without trial. Expedited deportation hearings and removal proceedings that violate human rights. The arrest of a beneficiary of the Deferred Action for Childhood Arrivals (DACA) program, Daniel Ramirez Medina, 23, who along with the program’s other 750,000 successful applicants had revealed all personal history to the government in applying for DACA status. Parents separated, perhaps forever, from their children. The hunted going underground. The end of the rule of law. The abandonment of the common good…White Europeans who are undocumented are not being targeted. The executive orders of President Trump are directed against people of color. – The Department of Justice civil rights division issued verbal instructions through the ranks to seek settlements without consent decrees — which would result in no continuing court oversight. Other Federal departments (Labor, Education and the EPA) scaled back the power of their internal divisions that monitor racialized abuse. 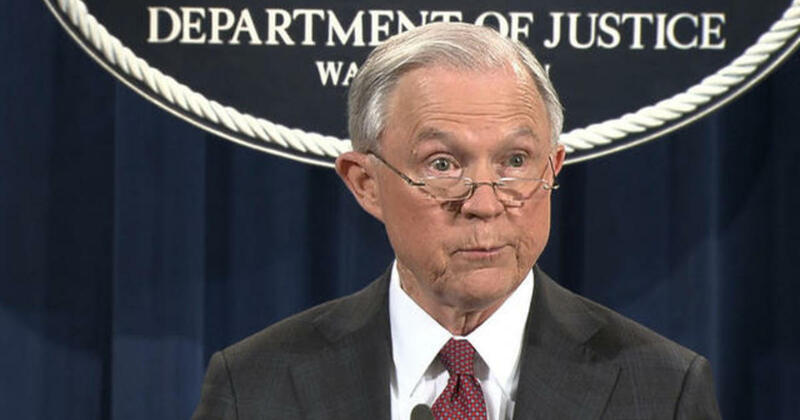 – Sessions fired the dozens of Obama-appointed U.S. attorneys who still remained on the job. A month later, none of them, nor the 47 who had already left, had been replaced. Sending another clear message to people of color, he called for reviving the war on drugs, and Trump withdrew Obama-era protections for transgender students. – In July, Sessions gave a closed-door address to a hate group. Then he announced a plan to boost the controversial practice of asset forfeiture, yet another policy that targets people of color. – Sessions’ nominee to head the Department of Justice’s Civil Rights Division, Eric Dreiband, was best known for defending Big Business against discrimination lawsuits. – The Department of Homeland Security withheld grants it had previously awarded to groups countering white supremacist violence. – Emboldened by Trump, U.S. border officials were lying to asylum seekers and illegally turning them away. – Outraged that New Orleans was removing Confederate Monuments, Alabama officials made such actions illegal in their state. – Montana Congressional candidate Greg Gianforte slammed a journalist into the ground and was elected anyway. – Alaska state senator David Wilson slapped a black reporter. – West Virginia state police arrested a reporter for repeatedly questioning Health and Human Services Secretary Tom Price. – Capitol police arrested a professional photographer who was recording the protests at Trump’s inauguration. As of May 1st, he was facing a potential seventy years in prison for rioting. – Over half of 2000 elementary and high school teachers surveyed reported increased racial and ethnic slurs and general hostility among students.